Alkali-metal and alkaline earth metal atoms do not immerse fully in HeN and reside on the surface, bound by long-range Van-der-Waals forces. 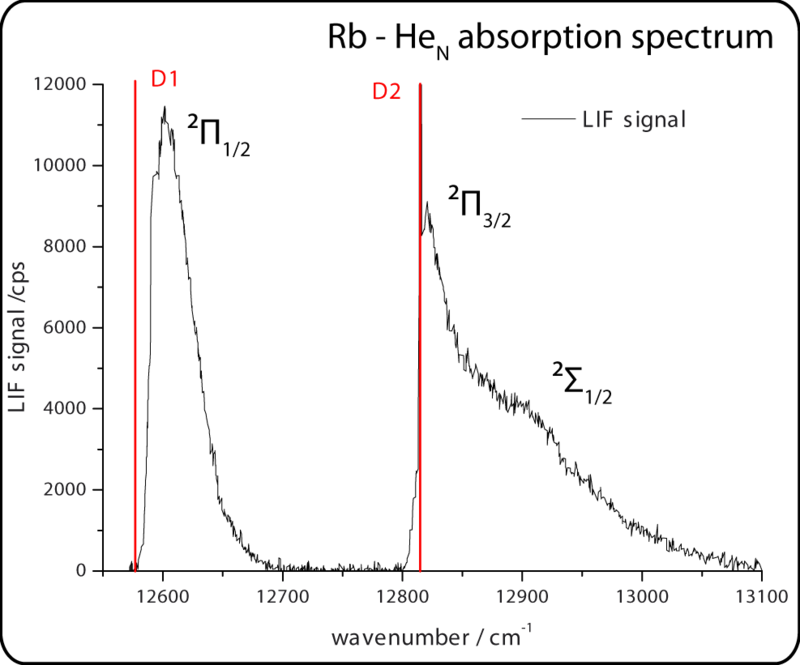 The interaction with the helium environment leads to a line-broadening in the laser induced fluorescence (LIF) spectra. The 52P1/2 (2Π1/2) and 52P3/2 (2Π3/2,2Σ1/2) transitions of Rubidium are blue-shifted with respect to the free atom D1 and D2 lines. Potential of the Rb-HeN system in the ground (buttom) and first excited (top) state. Upon excitation the alkali atoms usually desorb from the droplet. Rubidium and Caesium constitute an exception as the 52P1/2 (2Π1/2) forms a weakly bound state because of the large spin-orbit interaction. The Rb atom stays on the surface of the droplet and can be recycled . 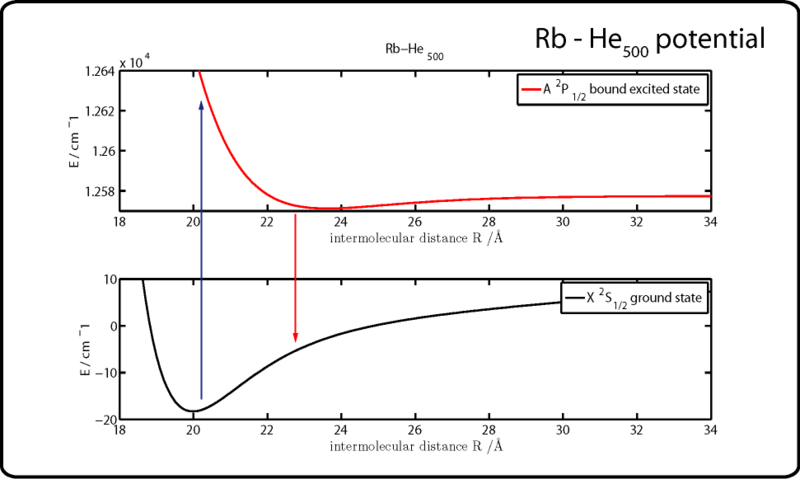 Helium density profiles for a droplet of 500 He atoms doped with Rb in there equilibrium states. The helium density of the droplet is altered by the dopant. The equilibrium is reached with a dimple shape structure. After vertical excitation the helium density adiabatically follows the new rubidium potential. Fluorescence takes place from the new equilibrium, then the system relaxes back to the initial state. 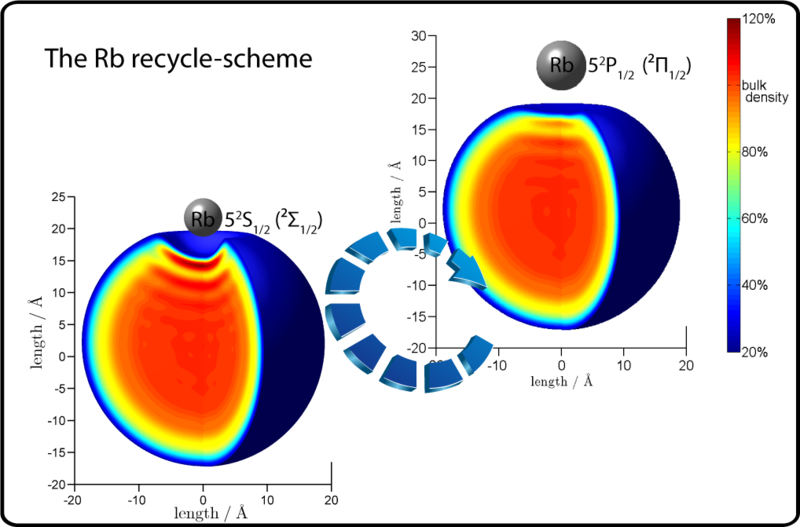 This Rb recycle - scheme could be exploited for optical pumping. Although the optical spectrum is broadened the atomic polarization is preserved to the hyperfine limit.